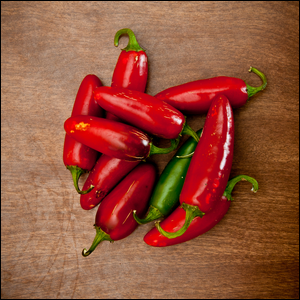 The Spicy Heat Of Chili Peppers Is Measured Using The? Douglas Adams Originally Wrote For Which Sci-Fi Series? Although we might use colorful language to describe how hot a pepper is, the scientific measurement of the spicy heat of chili peppers is measured on the Scoville scale, named after its inventor American pharmacist Wilbur Scoville. The full name of the procedure used to determine the Scoville rating is know as the Scoville Organoleptic Test wherein an exact weight of a dried pepper variety is dissolved in alcohol to extract the heat components (the capsinoids). The extracted capsinoids are then diluted in a solution of sugar water and given to taste testers who rank the solution. Although the scale is widely used it’s precisely this method, the human tasting element, that is criticised as a weakness. Different tests using the same solutions can yield responses from taste testers with a margin of difference in their ratings up to 50 percent. That said, the scale is long standing (it was invented in 1912) and is still widely used. The Scoville scale rating for peppers ranges from 0 for non-spicy peppers like bell peppers to 1-4 thousand for varieties of common peppers like jalapenos, all the way up to 1-2 million for ultra potent chili peppers selectively bred to be spicy like the ghost pepper (Bhut Jolokia), Naga Viper, and Carolina Reaper. Image courtesy of Andrew Taylor.